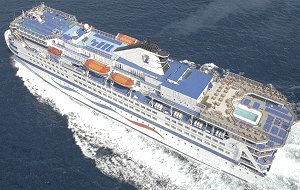 10 decks, maximum 1355 guests in 570 cabins, 4 elevators, 4 bars/lounges, restaurants, discos, game room, children's playroom, indoor & outdoor swimming pools, beauty centre, sauna, solarium, beauty salon, shopping area, hospital, conference centre (14 rooms), air-conditioned throughout, 2 cabins suitable for wheelchairs. 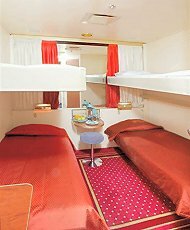 "DA", "D", "F", "G", "E"
* All cabins are equipped of shower, WC, wash basin, air condition with individual thermostat control, telephone, radio and hairdryer. 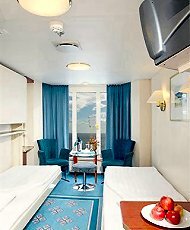 All suites have TV, safe and mini bar. 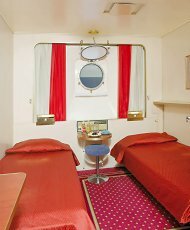 * "S" & "SB" cabins have 2 lower beds that may be converted into a matrimonial bed. 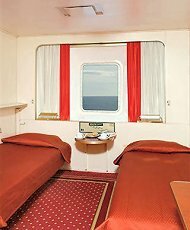 * All "SA" cabins have 2 lower and 1 upper bed. 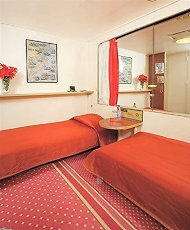 * All cabins from "TA" and below have 2 lower beds; the quadruple ones have 2 lower and 2 upper beds. 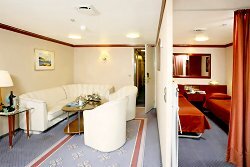 * All "E" cabins have 2 lower and 2 upper beds.